Baby strollers are versatile pieces of equipment that allow you to travel with your little one no matter the destination. Many baby strollers are equipped with cup holders, removable seats, and other features to make traveling easy for both you and your child. Moms and dads know how difficult it can be to bring their little ones along on an outing. With all of the accessories and amenities necessary to take good care of your child, it's easy to get overwhelmed. A good baby stroller will provide enough space for all your storage needs without neglecting the comfort of you and your child. 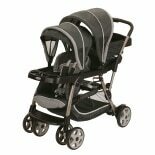 Quality baby strollers often feature a safe and secure harness and ample padding in the seat. Many even have reclining seats that allow your child to sit or sleep. Baskets capable of holding all of your little one's amenities are usually attached beneath the stroller seat for easy access. Whether you're running daily errands or exploring everything a city has to offer, baby strollers make it easier for you to move around town with your baby. 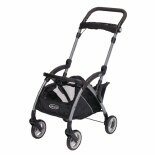 These durable strollers have numerous wheels on smooth-pivoting axles that allow you to easily maneuver them around a crowded street or through indoor traffic. Some baby strollers are designed specifically for off-road use. 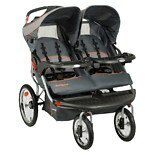 These outdoor strollers feature large wheels on sturdy axles that let you take your child along for runs through your local park or hikes on a nature trail.